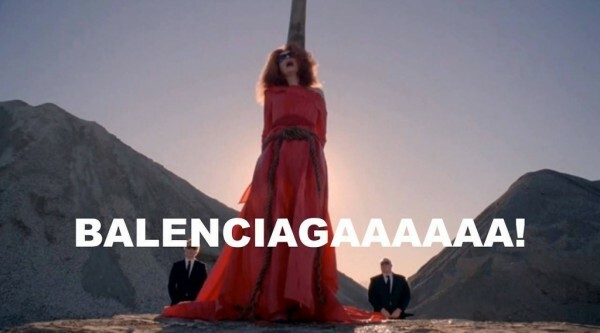 What Would Myrtle Think of Alexander’s Balenciaga? …yup, Balenciaga. So as a tribute to Myrtle, who is probably entertaining the nether realm with quippy one-liners about their fashion faux pas, I thought it fitting that we take a peek at the storied fashion house under the Creative Direction of Alexander Wang. Known for his urban rock-n-roll chic, the young Taiwanese-American designer took the reins from Nicolas Ghesquière in December 2012, and so far his first two women’s collections have been met with widespread acclaim. 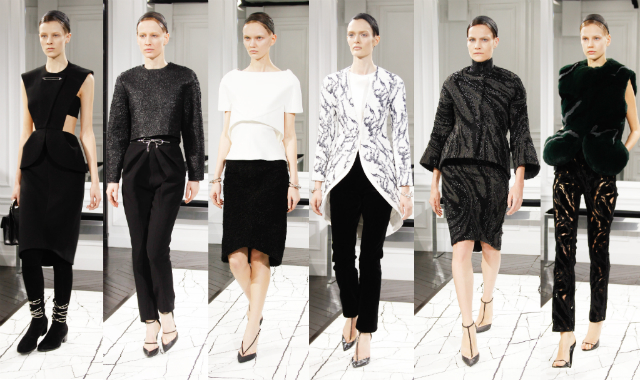 The AW13 debut collection was praised as “solid” by industry insiders. Tweeted recently departed Fashion Critic of the New York Times, Cathy Horyn, “Alexander Wang steps up to Balenciaga with a solid debut that plays on classic shapes in a modern, minimizing way. Great textures too.” And ELLE Editor-in-Chief, Lorraine Candy, called the collection a ‘powerful statement’ and said it looked clean, modern and importantly wearable. While there are marked contrasts between the two collections, I do see a few similarities creeping in, especially for these two looks. What do you think?